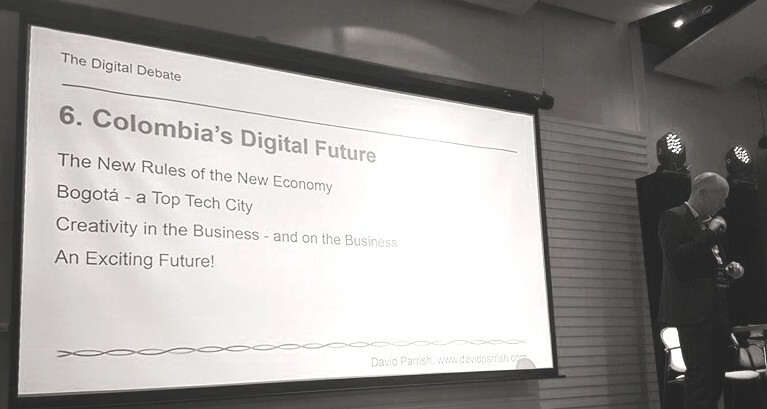 David Parrish was the keynote speaker at The Digital Debate in Bogotá, Colombia on Friday 02 October 2015. 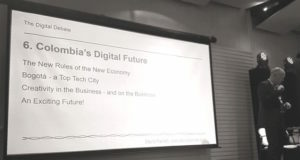 He spoke about growth opportunities in the creative and digital industries, especially the potential for Bogotá and Colombia, based on his experience of the creative industries in the UK and world-wide. David spoke about new business models in the creative industries, international business opportunities, growth strategies and connecting creative talent to the creative industries. He used examples and case studies from his own work, his clients’ successes and his international research. 1. Fundamental economic change in the ‘Digital Age’, from industrial production to an economy based on services, information and creativity. In other words, a transformation from “Bricks to Clicks”. 2. The potential for businesses in the digital industries to use business models that enable Exponential Growth. He used examples from his clients’ successes, his own business, and the contrast between hotel corporation Hyatt and AirBNB. 3. The opportunities available to creative entrepreneurs which enable them to become empowered through creative entrepreneurship. In contrast to the traditional ‘job for life’, people are designing ‘portfolio careers’ for themselves. Many younger creative entrepreneurs are unwilling to become employees and instead aspire to become business owners. David referred to his TEDx talk in Tromsø on the subject of Empowerment through Creative Entrepreneurship’. 4. Liverpool’s economic transformation, which now features a strong creative and digital sector. David has worked with Merseyside ACME and Liverpool Vision, the organisations which have helped creative entrepreneurs in the city to set up and grow their businesses, creating jobs and regenerating the economy. Though in some ways this is ‘The Invisible Sector’, its economic impact is significant. 5. Crowd sourcing and the potential for using the creative talents of people world-wide in creative businesses in Colombia and elsewhere. 6. The changing power balance between corporations and consumers, with customers being more powerful than ever before. There has been a progression from monologue to dialogue to ‘poly-logue’, for which David has coined the term ‘Plogging’. 7. Crowdfunding. David talked about his creative industries clients’ experiences of crowdfunding and his meetings with senior executives of Kickstarter and Indiegogo. He learnt about some of the challenges to crowdfunding in Colombia but was encouraged to learn about recent breakthroughs in this area and in particular the groundbreaking online article by Lizeth León about crowdfunding in Colombia. 8. David congratulated Bogotá in featuring as a Top Tech City in the category of ‘Builder City’ in the CITIE Report. This report is an introduction to the CITIE framework (city initiatives for technology, innovation and entrepreneurship), analysis and results for 2015. It complements the CITIE website, where more detail including full case studies and a diagnostic tool can be found. The Digital Debate was organised by Carlos Ramirez of ADDDATA, with support from a range of organisations and sponsors. For further information see The Digital Debate website and Facebook page. David is a consultant on creative and digital industries, working world wide and based in the city of Liverpool, UK. His work has focused on advising companies and institutions in different parts of the world looking to grow creative businesses. David has been invited to various countries to advise on entrepreneurship development and the management of creative businesses. He has worked as a consultant to various governments on the implementation of policies that help foster the creative industries. He is author of two books – the bestseller “T-Shirts and Suits: A Guide to the Business of Creativity” and his latest book “Chase One Rabbit: Strategic Marketing for Business Success” aimed at creative entrepreneurs. What is the Digital Debate? “The Digital Debate” is for all those who want to discuss the digital and creative industries; the objective is to demonstrate the contribution they make to economic, social and cultural development. “The Digital Debate” is an event developed and created by Adddata Ltd. With the support and advice of England’s Liverpool Vision, the official body charged with promoting the digital and creative industries in the city of Liverpool – UK. This debate has been conducted in England by experts; Colombia now wants to replicate this experience, further democratizing participation in the creative and digital sector. For us, their opinions and ideas are fundamental, they are the basis of “Digital Debate”. We believe that open spaces that are not only dedicated to experts is the way to contribute to the development of this new industry, which requires the participation of all those somehow linked to the digital and creative industries, which still has a long way to go in a country such as Colombia that is characterized by the talent and creativity of its people. Participation is through the registration form which can be reached by the button located on the right side of the website for those who are interested in participating in the “Digital Debate”. People may apply as debaters, choosing the topic that want to participate. Once registered on the form these should be accepted and validated by the organization. To attend as an audience participant it is necessary to register as a “Debater”. It is prerequisite to be registered to attend the “Digital Debate” either as “Debater” or participating member of the public. The discussion is based on opposing ideas, so it is important to respect others with different views. For a fluid debate it is essential to keep to the times assigned. It is recommended that concrete ideas are disscused. We suggest researching the subject on the table and prepare arguments in advance. It is important to listen carefully and take note of what others say in order to respond directly to their points. The moderator who directs the debate will provide guidance and instructions to the people debating. “The Digital Debate” busca convocar en forma abierta a quienes quieran debatir sobre las industrias digitales y creativas ; el objetivo es visibilizar el aporte que estas hacen al desarrollo económico, social y cultural del país. 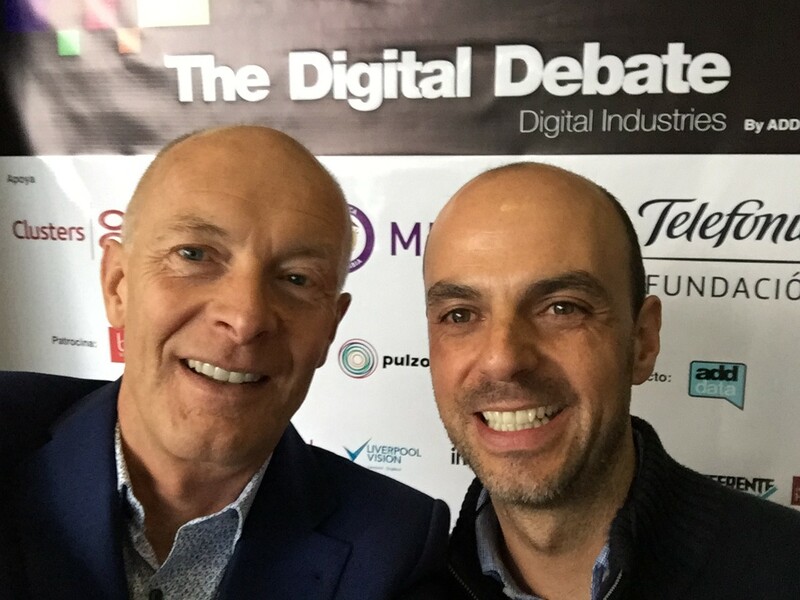 “The Digital Debate” es un evento desarrollado y creado por Adddata Ltda. con el apoyo y la asesoría del Liverpool Vision de Inglaterra. Entidad oficial encargada de promover las industrias digitales y creativas en la ciudad de Liverpool – UK. Este debate se ha realizado en Inglaterra por expertos; y en Colombia queremos replicar esta experiencia pero democratizando aún más la participación. Para nosotros sus opiniones e ideas son fundamentales, son la base del “Digital Debate”. Creemos que abrir espacios que no solo estén reservados a los expertos es la forma de aportar al desarrollo de esta nueva industria, que necesita de la participación de todas aquellas personas vinculados de alguna manera a la industria digital y creativa, la que aún le falta mucho por crecer en un país que se caracteriza por el talento y la creatividad de su gente. Mediante el formulario de inscripción al que se llega por el botón que se encuentra en la parte derecha de la plataforma quienes estén interesados en participar en el “Digital Debate” podrán aplicar como debatientes (Debaters), eligiendo el tema en el que quieran participar. Una vez inscritos en el formulario estos deben ser aceptados y validados por la organización. Para asistir como público participante es necesario hacer el mismo registro en el formulario de inscripción pero sin aplicar a ser “Debater”, teniendo acceso a la sesión de preguntas una vez finalizado cada debate. Es pre requisito estar inscrito para asistir al “Digital Debate” ya sea como “Debater” o como público participante. El debate se basa en ideas opuestas, por lo cual es importante respetar las del otro así sus ideas no concuerden con las tuyas. Para un debate fluido es indispensable cumplir con los tiempos asignados. Se recomienda ser concreto con las ideas. Sugerimos investigar la temática de la mesa y preparar los argumentos con anticipación. Es importante escuchar atentamente y tomar nota de lo que dicen los otros participantes, para así responder directamente a sus planteamientos. El moderador es quien dirige el debate, el encargado de otorgar el derecho al uso de la palabra, debes seguir sus indicaciones. Asesor internacional en negocios creativos y digitales en la ciudad de Liverpool-UK. Su trabajo se ha enfocado en asesorar empresas e instituciones en diferentes partes del mundo que buscan hacer crecer los negocios creativos. David es invitado a varios países a dictar conferencias dirigidas al emprendimiento, desarrollo y ejecución de este tipo de empresas, ha trabajado como asesor de diferentes gobiernos en torno a la ejecución de políticas que ayuden a fomentar las industrias creativas. Es autor del exitoso libro “Camisetas y Corbatas: Una Guia para los Negocios Creativos” y recientemente acaba de editar su ultimo libro llamado “Chase one Rabbit” dirigido a emprendedores creativos.